Too many cooks might spoil the broth, but two (soon to be) married chefs get it spot on. If you thought wedding planning was a test, try running two restaurants, regular functions, and out-catering all from the same kitchen. 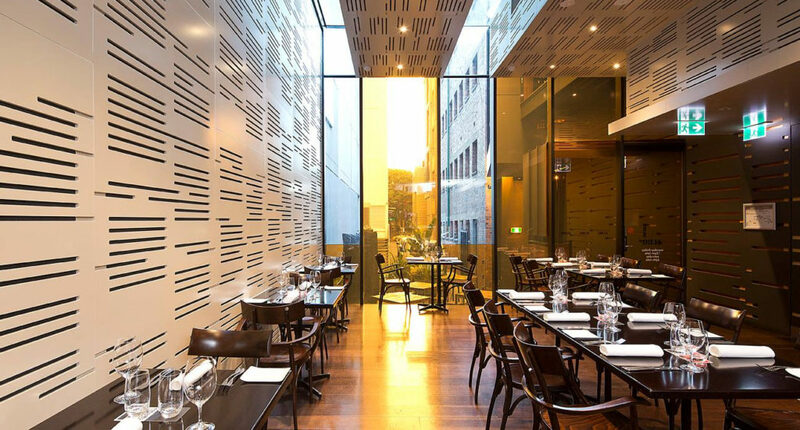 Chefs Andrew Gunn and Amélie Rabaud have their hands full doing exactly that at one of Queensland’s top restaurants, Urbane, and sister venue The Euro. As if the meticulous operation of that very busy kitchen wasn’t enough on their collective plate, Andrew (executive chef) and Amélie (head chef) are also engaged, after meeting and working in Michelin-starred venues in France including Restaurant Christophe Bacquié, Le Taillevant, and Le Cinq. 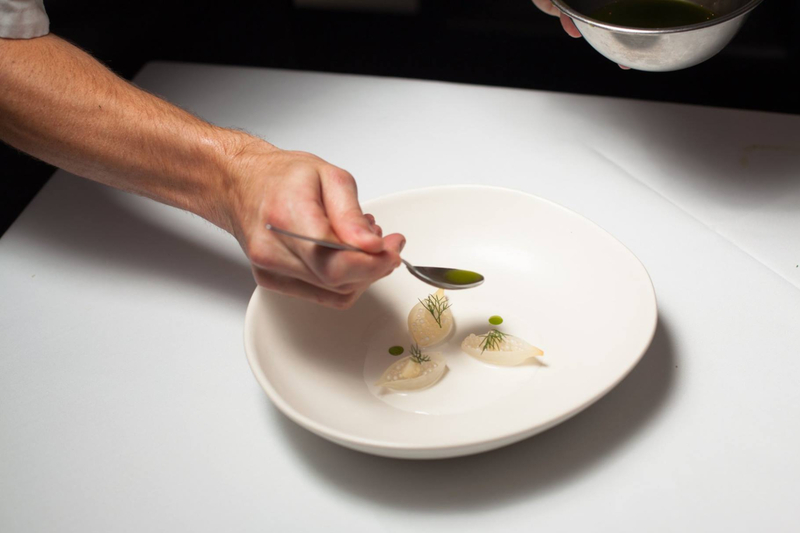 While Andrew is a Brisbane boy who’s followed a relatively standard chef trajectory (with the odd international foraging trip thrown in), Amélie, who’s originally from the South of France, followed a slightly different path. It’s a path that would ultimately lead her to some of Paris’ top kitchens, including Le Grand Restaurant, and to working with her future partner in life and work, Andrew. After spending a few months shadowing the venues’ former executive chef, Alejandro Cancino, Andrew and Amélie’s goal was to pare things back at Urbane and The Euro, and focus on the food being sent out of the shared kitchen. And bring it back to life they are – the extensive autumn menu features eye-catching (and mouth-watering) items like veal tartare with gochujang and gomashio, seared scallops with cauliflower purée, miso butter and crispy kale, and honey-roasted pumpkin with hummus, Israeli couscous and ricotta. While the renowned five- and seven-course degustation menus remain succinct and restrained at Urbane, The Euro’s autumn menu is an extensive list, heaving with meat, seafood, vegetarian and vegan, and sharing options. What does the power couple behind the kitchen recommend? For Amélie, it’s the pasta. “We weren’t sure that we’d put pasta on the menu… but it’s happened to be a hit! It’s a fettuccine of the day (so it’s always different), but the seafood is definitely my favourite. I’m a big pasta lover – pasta to me is like the poorest, cheapest dish ever, but it can be one of the most fabulous ones,” she muses. Andrew also has a favourite that lies close to his heart: “We’ve been working with Brooklet Springs farm for quite some time – they’ve brought out a baby chicken which we spatchcock, grill, and glaze with a honey glaze. All the honey comes from my parents’ place, out at Brookfield, it’s the best honey I’ve ever tasted,” he reveals. What is clear when meeting Andrew and Amélie is their absolute passion for shaping and growing these much-loved Brisbane venues – a shared commitment that they each firmly and warmly express. In the kitchen as in life, it seems. - the gourmet who hopes she's invited over for dinner soon.